Quick post to show you my progress. Maybe I'm half way done? I'm not sure. I'm thinking I might want to do a few rounds around the outside to make it bigger anyway, so who really knows. I'm just happy it appears to be getting bigger. Maybe I'll finish in time for Christmas. Darn. Now that I've said that, it sounds like a goal or something. Midterm grades came out last week. I have an A- in my public speaking class (it will go up, we do a semester long test, and the best score out of three counts, so once I take it the final time, I think I will have an A in the bag) and an A in my Organizational Effectiveness class. I have to watch that one, because I'm at the point where I'm starting to be highly UNmotivated to do my assignments. Always dangerous territory. I love it! Such a classic, I've been wanting to make one of these. Beautiful. It's beautiful! Congrats on your grade! 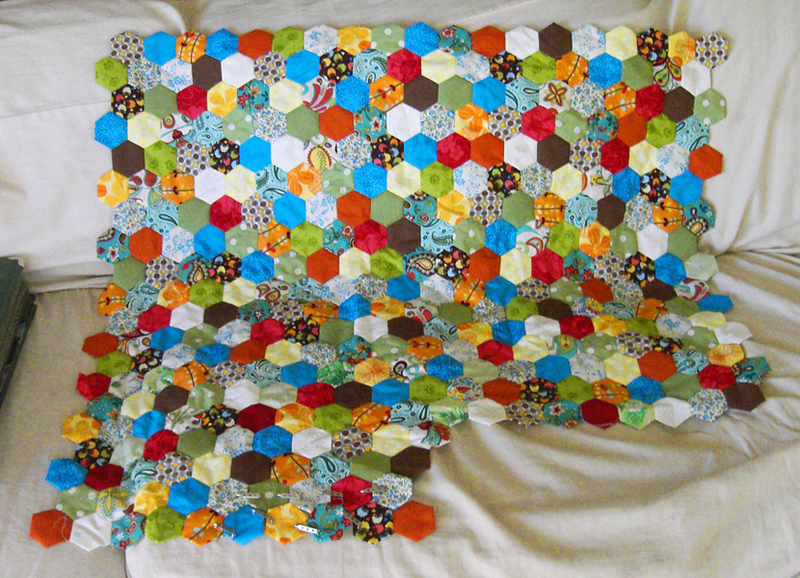 I love the colours in your hexie quilt! ...and yay for you, you smartypants!!! great job on your classes! I featured you on my blog!!! I hope you can stop by! Truly an inspiration, I look at this and I am inspired, though at the same time I feel so unworthy lol. You really make it look easy! 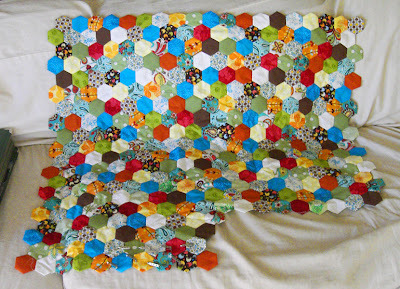 I am so inspired by your work, and this quilt is truly amazing. I showed my mum too, and she thought it was stunning!!! !